The final of the State Open Fours at District level was played on 29 May at Asquith with the Turramurra team of Jan Martin, Marilyn Brenner, Jenny Wallis and Sue Hamilton continuing the excellent bowls they had played all tournament to emerge, in near-darkness, as the 2018 champions. Click link below for the full Results. 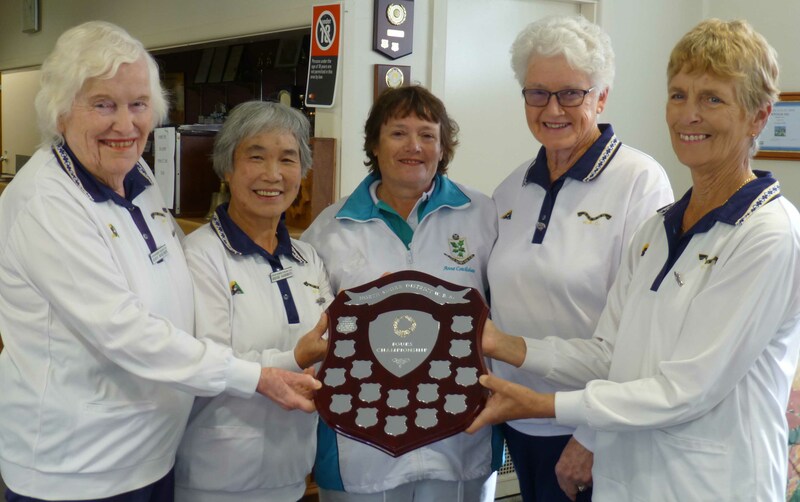 In a nail-biting final at St Ives on 14 February 2017, the Belrose team of Lorraine Hazzard, Judith Carpenter, Kay King and Patricia Tan overcame being down 3-13 after 12 ends to win the 2017 Open Fours Championship 26-20 over the Neutral Bay team of Lesley Szumylo, Midori Matsuoka, Maggie Jay and Lou Hamshere. The final of the 2016 Open Fours at District level became a rematch of the 2015 final, with Lynne Thompson’s Neutral Bay team and Bridget Nelson’s Gordon team once again playing off for the title. Gordon were ahead throughout the match until Neutral Bay drew level on the 19th end. Gordon was up by 1 shot going into the last end, but a great last bowl from Lynne took the jack back to two Neutral Bay bowls to win the Championship. A great final! 2015 winners: J Mortimer, S Hashimoto, H Stromsmoe, B Nelson Gordon) with the donor of the trophy, Anne Cowlishaw (centre). The inaugural winners of the Open Fours became the proud inaugural holders of a trophy kindly donated to our new District by Anne Cowlishaw (St Ives). Thanks to Anne’s generosity in “starting the ball rolling”, we now have trophies for the Fours, Singles Champion, Singles Runner-Up, and soon to come, Triples.